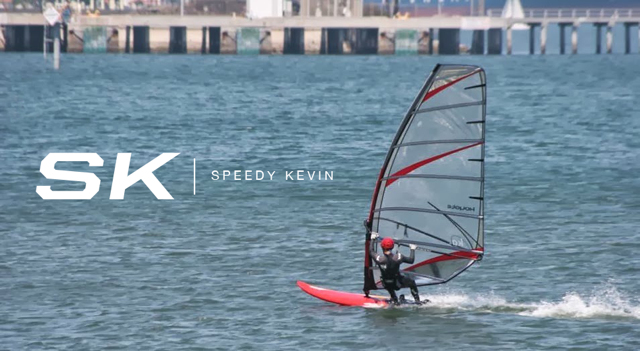 Speedy Kevin: Records Are Made to be Broken! Yesterday was definitely one of the best days of the last 2-3 weeks. The forecast was almost spot on with its promising 20mph+ prediction. Well more like 15-20mph for most of the day with a short stint of 20+ for about 20 minutes near the end of the day as the beach cooled down a bit. I decided I was not going to miss the wind so I came earlier than usual: 12:45pm. The early birds were Lorenzo and I with Jim, Juan, and Igor coming later in the day. Since I was trusting the forecast I decided to rig my 6.6 Koyote and 31cm Select Vmax. The first hour of sailing was pretty good, definitely above average for sure as I had hit a 30.4 and 30.34kt peak in the first 5 minutes. This got my hopes up high as the wind was getting stronger but all of a sudden died(went west). That was when Lorenzo derigged and headed back to work. I decided to come in and get some water and talk to Jim before going out again. Thankfully it was getting strong again and Jim decided to rig his 6.0 and smaller board. I personally think this is the bad luck rig as every time he rigs it the wind almost dies within 5 minutes! Thankfully though the 20mph+ winds lasted for about 20-25 minutes. My first run in the new conditions scored me a new spot record of 30.9kts! The next run resulted in a 31.2kt max! Now I was getting really excited! I have been trying since the start of August to match the speed Philip Newmarch got on the outside (32.17kts) and today looked like it was going to be the day! For the third run the stars must've been lined up just properly as the gust was strong and long which is rare for Cabrillo. I definitely knew that had probably been one of the fastest runs I have ever done on the inside but wasn't sure so instead of gybing at the end I dropped in to check the gps... 32.08kts!! I was now only .1 kts away from Philip's outside record!! But all good things have to come to an end and that is what happened. The wind started to back off so I tried as hard as I could to catch all the remaining gusts I could. Was only able to score 2 more runs at 31.5 and 31.4. It should be noted that I wasn't the only one having a great day. Jim Martin set the speed record for FreeRide at 29.68kts while Juan Yusti set the FreeRide 5x10 record at 25.9kts. Well done gents!! Definitely was drain by the end of the day and was sure hungry! Only had a little traffic going home as it was 6:30pm. Got home, washed the gear down and had my traditional post-session ice cream sandwich :D. Than made a pasta dinner with Vivian and called it a night.